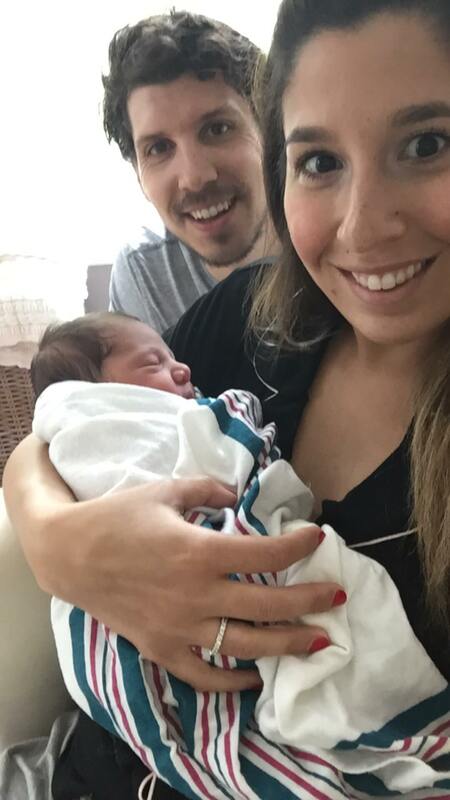 Thank you to Hypnobabies Instructor Jessica Santangelo for sharing her student’s birth story. Our sweet baby Mason Jude was born last Friday May 13th at 4:33 am. He weighed 7 lb. 10 oz. is 19.5 inches long. I wanted to share our birth story with you because it was everything we had hoped for and Hypnobabies really helped make it an experience we will always cherish! When I found out I was pregnant I was determined to have a natural childbirth. My husband and I strive to live a healthy natural lifestyle and it was the way I always pictured my birth story going. I decided to use Hypnobabies to follow in the footsteps of my 2 close friends who both had instilled in me only a positive view of pregnancy and giving birth. At 28 weeks pregnant my husband and I decided on having a homebirth. Although this was not what we initially pictured it ended up being the best decision we made! Hypnobabies really helped me clear any fears I had and become confident in our decision. When I hit 39 weeks pregnant the Saturday before I gave birth I let go of the idea that I would be one of those moms who had an early birth and settled into the thought that I could be pregnant for another 3 weeks. I repeatedly heard my Hypnobabies pregnancy affirmations in my head telling myself babies come when they are ready over and over. I spent the first few days of that week trying to nest, walk a lot, get lots of chiropractic adjustments and use my Hypnobabies to clear my head. That week around 12:30 am on Thursday morning I had my bloody show. I was so excited because I knew that our baby would be coming soon. It felt like waiting for Christmas to come. I had begun having pressure waves but they were totally manageable and I didn’t think much of them. I called my midwife to let her know and she could hear the excitement in my voice. She told me to sleep and touch base with her in the morning. I put on my hypno-deepening track and slept through most of the night waking only once or twice. I woke up early that morning still thinking I was going to work. Even though I thought the baby would be coming soon I still was thinking I had a few days to go. I noticed my pressure waves got a little stronger and as I got up and moved around they weren’t going away. I decided to take a shower to see if that would cause a change. After I showered and started my morning I noticed my pressure waves were coming regularly about every 5-6 minutes and decided not to go to work. When I checked in with my midwife I said I was comfortable and she didn’t need to come. I spent the morning doing things I loved. I took my time getting ready while sitting on my birth ball, made a healthy nourishing breakfast, and relaxed around the house. I immediately began playing my Hypnobabies tracks. I had my pregnancy affirmations and birthing day affirmations playing out loud on repeat from when I woke up. I continued to notice my pressure waves lasting a little bit longer but I was still able to go about my morning. About an hour later I lost my mucus plug. I called to let my midwife know and she said she would come by in an hour just to check on me. In the meantime my husband and I went on a short walk around our block while I played Hypnobabies tracks as we walked. I still was thinking she was coming unnecessarily and wasn’t convinced it was my birthing time. When my midwife arrived she checked me and the entire time I was completely comfortable she told me things were definitely happening and told me to go on another long walk and she would be back in a couple hours. My husband and I were so excited! We went on a long walk down to the beach that we love by our house. I’ll never forget that moment with him. At this point my pressure waves were getting stronger and longer but I was completely comfortable. I would stop and turn my mental lightswitch off on our walk and then continue. When we got to the beach I felt so peaceful and ready for the rest of the day. When my midwife returned in the afternoon she said it was definitely my birthing time and she would be seeing me later that night and to rest up. I was able to take a short nap through my pressure waves, took a shower and before I knew it was almost 9:00 pm. My midwife checked in and I told her I was going to sleep. She started laughing because she said if I could sleep I was not in labor. In my head I was still convinced I could sleep. I had been using my Hypnobabies mental lightswitch all day long and still listening to a mix of different hypnosis tracks and felt calm and comfortable. When I tried to go to sleep I realized that wasn’t going to happen. I was still able to feel calm, comfortable, and relaxed. I wasn’t quite convinced that it was actually my birthing time. But by 10:30 I knew that it was. Around 11:00 my midwife and her assistant arrived. I had my headphones in and was really focused the entire time. As my pressure waves got stronger, longer, and seemed to be one on top of the other I remembered to take it one wave at a time. I never thought about the next wave coming, just tried to stay present in the moment. I loved listening to birthing affirmations repeating them over and over. I continued to use my lightswitch turning it off when a wave came and hanging on to my husband or stopping until the wave passed. I spent about an hour and a half sitting in the water when my pressure waves got really strong. I remember my Hypnobabies putting me into such deep hypnosis that I felt like I was sleeping for the short time in between each wave. During this period any time a negative thought came into my head I quickly remembered what I learned in Hypnobabies. I acknowledged that I was having the thought, quickly let it pass, and replaced it with a positive affirmation. At some point my midwife told me she knew I could try to push if I was ready and she would check me if I wanted. In my head I kept thinking this has to get worse so I said I could hold out a little longer. Eventually the urge to push became strong and my husband played pushing baby out. Our baby Mason was born at 4:33 am. It was such an incredible experience and exactly what we wanted. Our midwife was completely hands off my entire birthing time. It was such a powerful experience and I still can’t believe it has come and gone. My midwife said that “my amnesia kicked in really fast” as I was telling her that running the NYC marathon was harder and I was ready for baby number two moments after giving birth and it must have been “hypno lady.” Thanks to Hypnobabies I was able to have a comfortable, calm, and positive birth and wouldn’t have had it any other way!